Subject: New Members, Welcome Aboard! Rockland, MA United States There's been an influx of new members to the Riders sites and I just wanted to extend a welcome and urge you to participate! The sites are open and free, we just ask that you register and participate! If you have a question about Victorys, most likely someone here has an answer. You'll find the members helpful and courteous. We ask that you be the same. I urge you to post photos of your bike, your bike trips and introduce yourself. You can also create your own profile, blog and riding groups (or join ones already created) on our sister website, the Victory Riders Network. Winchester, Virginia I am a newbie since I just joined today. I have a 2010 Victory Vision Premium in Pearl White. I bought the bike in April of this year and just turned 6,200 miles this past weekend. Great bike!!! West Knoxville TN Well rebel715 welcome with that new pearl white vision. Welcome and I'm just across the border from you and also own the Pearl White 2010 Vision. Love it and this is a great forum. Lots of super information. Hello everyone.I thought I'd just drop you a line from Derbyshire in England.I've got an ice blue Vision with 3000miles and never thought i'd own a bike better than my Honda Valkyrie,but the Vision is that bike.Me and the wife are already planning a France-Switzerland-Italy tour this summer so we'll keep you posted.Bye[Paul and Jackie Galpin. Indianapolis, IN Welcome aboard from across the pond. Those of us state side have a hard time imagining what it would be like to tour Europe on a bike, sounds like a lot of fun. My family originated in Switzerland, never been there. Enjoy and keep us posted. San Antonio, TX Here are some blogs from Bums on Bikes. They are from New Zealand and took off a year to ride two Visions across the US and Europe and back across the US. They had the Visions shipped to Europe and back to the US and......when the trip was done, had them shipped home to NZ. Lillian, Alabama Greetings fellow Visionary's! I'm new here so I thought I'd introduce myself. My name is Paul and I've just moved (6 months ago) to the beautiful oil covered Gulf Coast....Lillian, Alabama. I live just across the Bay from Pensecola, FL (I can see FL from my front porch). I think I'm going to love it here, with the 12 month a year riding season and all *grin*. I'm currently dividing my riding time between a 2008 Midnight Cherry Vision and a 2005 Yamaha Road Star Midnight Custom. But I've found that I like the Vision so much the Road Star in now for sale!!! I've already read through much of the site and am excited to have this resource available and getting to know some of y'all. If any of you live in this general area, let me know. Welcome! I see you are trying to make me jealous, but it won't work, I ride a 2008 MC Tour Premium also. Hope to ride around your way sometime. Welcome to you 'New Members' and thanks for joining our group. Please feel free to chime in with your comments and questions...Remember, there are no stupid questions. We were all new to motorcycles and Visions at some point in time and had many unanswered questions. This board has a lot of seasoned members and even 'Techs' that hang here regularly. I have found it to be a wealth of information and 99.99% of the time a very friendly group. Enjoy your bike and stop by this forum regularly or you will miss something of real value that will improve your motorcycling experience! Lennox, SD Welcome all new members! Pull up a chair and just jump in any time you are ready. Hello and looking forward to be part of this. I have a new 2008 Vision Premium that I bought off the showroom floor last September. Then had neck surgery so only have 3800 miles on it. Taking off to the Grand Canyon on 19 day trip starting Labor Day. Just picked up a N-Line trailer and looking forward to see how that tows. I welcome any suggestions on routes through, and over, the mountains....Grand Rapids, MI. You have a keeper! Feel free to post if you have any questions! New guy saying Hi from SW Indiana. Santa Maria CA USA Hi from Santa Maria CA USA. Had My 2005 Hammer Premium sice Feb. this year. Done some upgrades since then. Absolutely LOVE IT! I am a newbie since I just joined today. I have a 2010 Victory Vision Premium in Pearl White. I bought the bike in April of this year and just turned 6,200 miles this past weekend. Great bike!!! Welcome Randy, nice bike. Lots of long-time Victory owners here if you run into any issues with your Hammer. Hi There, we live in the beautiful, sunny South Africa, proud owners of 2008 Vision(Black). Currently there are only three Visions in all of Africa (all three of them in South Africa I must add). We live in Johannesburg, the other two Visions (both Midnight Cherry)are owned by a guy in Cape Town and another guy in the North west region of South Africa respectively. Edmond, OK 2012 Vision, 2012 Cross Country Freedom, Welcome to Vision-Riders glad you are here with us., there is lots of information here on the website to help you in your needs for modifications or just regularly scheduled maintance type of questions you may have along with several videos on how to make the modification to your bike. Take care and welcome again and please ride safe!! Flowery Branch Ga I never properly introduced myself, so here it goes. My name is Wayne. I'm married with two wonderful young boys. I started riding in the spring of 09 on a 105 Ann. 1200 Custom Sportster. I loved that bike, put almost 7000 miles on it. It was small, top heavy, vibrated, shook, road like crap, got bad gas mileage for a small motor, and I still miss it. I wanted a bigger bike but wanted black and different. Then the wife realized all the fun she was missing out on and decided to start riding with me. She liked the Vision as much as I did, a deal was made, and on Sep. 8 10 I became the proud owner of a 10 Vision 8Ball. To date we have a little over 3000 miles on it. If anyone in the NE Ga area wnts to ride let me know. Minnesota Here is me and my wife on our 1999 V92C. We love the bike and enjoy riding it everywhere, as much as we can anyway living in Minnesota. Lincolnton, NC My name is Linda. I live in NC. I ride 2009 Ness Vision number 105. Rockland, MA United States Welcome gammaqueen, Hope you find this site full of info and new friends. Fryeburg ME Welcome Linda to a great site with a wealth of info, I'm from NH well via Australia 11 years back, my riding bud from Maine and I were down your way on the dragon last October and will be back down there the first weekend of October this year, we had 2 2009 Ness Visions down there one ridden by a lady rider Deanna aka Calista on the VMC and another lady vision rider was on her black vision Terri aka TKT2RIDE on the VMC come play with us all we had like 39 Victories in the Mountans of NC last year, sorry for the elongated rant, again welcome to the wonderful world of victory visions. Lincolnton, NC OMG, let me know when you bring all those Visions to the Dragon again! I only live a few hours from there and would love to add my "Mjr. Tom" to the Vision parade! seattle, wa Mjr. Tom....I like that! Welcome gammaqueen. We will be back in NC the first weekend of October. Staying at the Iron Horse Motorcycle Lodge again. Last year we took a rather spirited ride over the Dragon and Chewohalla Skyway with a few guys. Did part of the Blue Ridge also with a larger group. This year we are staying in the Rocky Top cabin. Lincolnton, NC Cool, I love the Ironhorse! Just reserved a cabin room for June. OMG, let me know when you bring all those Visions to the Dragon again! I only live a few hours from there and would love to add my "Mjr. Tom" to the Vision parade! Roger that Ground Control will most certainly do that. MA Hello all, My name is Rob, I own a 2010 Cross Country, purchased almost a year ago, here in MA. Just joined the site yesterday. Have added a few things to the bike. Ipod and different grips when ordered. Since I have installed the flip windshield and lowers, what a difference that makes. Chrome gas cap, highway pegs. And waiting impatiently on my D&D slip ons and Lloydz fuel controller and will be installing that this weekend. Bought the bike at MOM's. Anyone else here in MA, give me a shout. That's all I got for now. Rockland, MA United States rek58, Welcome aboard! Post some pics of your ride. There's a few of us in your area. Hershey, PA Howdy all, my name is Erik. I live in Hershey, PA and have 3 small ones... one's 5 and the other two are almost 3. I have been riding since I was 17, got my class M when I turned 18 (parents' rules... not mine). I own/love a 2010 Vision 8-Ball, and cannot get gas or park without someone asking me about it. This is, without a doubt, the best ride I've ever owned, and I've had my share of 'em!!! Only "mod" I've made so far is switching the Blade windscreen for a Tall (I'm 6'4", the stock just wasn't cuttin' the mustard). My wife will not ride with me... so I'm looking for any groups around here as we're sorta new to the area! South West Iowa Hello to everyone. My name is Brian. I just recently found this site. I spend a lot of time on another Victory site. I fell in love with the Hammer the 1st time I saw one. I couldn't afford one at the time so I started out with a 2009 Vulcan 900 Custom. Great bike but it wasn't what I wanted. Now that I have my Hammer I love it. I've had it since June of 2009. I'm hoping to learn more about the brand and give out what little advice I can. What year is your Hammer? Let us know if you have any questions. It's a 2009. I bought it as a left-over. When I went into the dealer it was originally all black. I couldn't quite pull the trigger on it so they sweetened the pot by saying they would swap all of the tins with the 2010 sitting right beside it for no extra cost. That sealed the deal for me. I put pictures of it in the gallery. My name is James and I bought an 06 Jackpot in September 2010. Forums, reviews, and the look and the style of the bike sold the brand when I started looking for a cruiser. I bought my JP on Ebay from a Chevy dealer in NJ (I live in Hampton Roads VA). My first ride on it was the 400 mile trek home after deciding to pick the bike up rather than ship it. I've been in love with the bike ever since. I've put about 5000 miles on the bike in 8 months, nearly doubling the mileage since I bought it. I know I made the right choice and plan to enjoy this bike for years to come. New York State What are the locked Forums why do I not have permission to read them ? welcome post a photo so we can stair at your bike. I have posted on here once before but never posted here. I am the winner of the Spring Victory contest and should be getting my 2011 Vision Tour this week. I live in the Mennonite lands of central PA and currently ride a 2007 Suzuki Boulevard C50. Well thats a stretch really my son and I ride the Boulevard. He's only 11 but now that his feet fit the pegs he goes out with me. Which is why I chose the Vision Tour. So that he had a comfortable perch for the longer rides. Welcome aboard Raybob and best of luck with your new ride! Rockland, MA United States Welcome fodder650 and raybob, glad you became part of the gang. Post a photo of your bike when you get a chance, and fill in your location in your control panel so we know where you are and if other members are near. Mena, arkansas / 12 vision I've been on for a while before posting, and now have a thread going and have responded to a few posts. This is a great place. Thanks for all the hard work keeping this thing up. Should be a mandatory when you join you have to post pitchers of your bike. That cause I never get tired of looking at the vision. 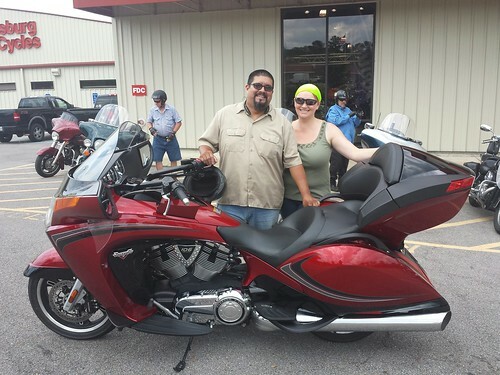 Brooksville Fl Just purchased a 2011 Victory Vision Tour. Riding in Fl at this time of the year is GREAT! Looking for a drivers back rest w mount! Any suggestions? Hey all, been reading many post for about a month, never posted. This site is dangerous, got to many ideas from everyone. From Mass. Have an 08 midnight cherry Vision. Bike is totally stripped down naked right now, Just had bike lowered 2", shorter kickstand, skid plate, inner bags cut to accomodate lowering, Front lights blacked out, rear lights black cherry, hawg wired stereo (all from HMD) installed D&D slash cut pipes, Lloyds cams, intake system, fuel controller, idle air valve, Muth turn signals, Ness low seat, chrome fairing, side cover, rear tip overs, and rear valence, custom finned engine covers, custom brake and clutch covers, and in the process of having air brushed. All this in the last 2 months. Ya think I'm excited for spring time or what! Will post pictures if I can put it all together again. Please don't give me any more ideas, it's not even January yet. Rockland, MA United States Welcome all new members! Many of you have been lurking for awhile and finally decided to register so you can participate and add your insight/experience/enthusiasm to the mix. We're glad you made it official and encourage you to post a hello in this thread. If you were referred here from another site, or by someone, let us know. We're all ambassadors for this site and enjoy knowing when we are successful in bring in new friends. Don't forget to add your location so we know if you are near us. Fostoria Ohio USA Newbie on this forum but have been riding since 1970 and once owned a 2004 Kingpin. I just got back to Victory last Friday when I traded in another make & model for a new 2012 Cross Country in the Red & Silver two-tone. Five days and over 200 miles into owning this bike all I can say is Sweeeeet!! Hey, neighbor! I'm also a new Victory rider (2012 Vision, Sunset Red) and I'm also in North FL. Been riding all my life and am fortunate to own a few other really nice rides (including 1 brand X). I live in Ferrnandina Beach, maybe we can meet up some time. Also looking forward to catching up with as many others as I can as we are out enjoying the ride. Happy Thanksgiving to all! Welcome to all, you'll find this forum has many good ideas and more importantly, many solutions. Hey Everyone, Whalebone here I am new to this forum I just bough g it home so 2011 Vision today and I am having a little work done on it before I bring it home. I will pick it up this weekend and I will start wearing it out then. It was sold to me as a new bike even though it is a 2011. This is somewhere around my 38th bike I have been riding since the early 1970's/ I traded in my 2007 Vstrom on the Vision. I have slowed down a little I only keep one or two bikes at a time anymore. I live on Camano Island in Northwest Washington, I enjoy motorcycles, live music, fresh air and good food. Welcome to the site Whalebone! hello all, new member here. I took delivery of my 13 XC in Sunset Red over the weekend and put a quick 200 miles on her. I really love this bike, everything and more I could ever want. I also own a 2011 Yamaha Stryker that I have totally customized. The great thing about this bike is it has everything so I doubt I'll be doing much. Hey guys, Joe from Alberta onboard. As you can guess i picked up a 2008 Jackpot Premium Edition this month....now the waiting begins, come on spring!! !..Great looking site and it appears i have some reading to do...see ya on the blacktop!! HI Everyone! I'm also a new member to the forum. I'm new to the custom world and especially to Victory motor cylces. The information on your site and from friends who won't ride else but a Victory have convinced me to put an offer on a 2007 Kingpin. Look forward to sharing my insights on my rides using my Kingpin. is there any one to welcome me ? easygame366 - 2013-02-17 7:35 AM elvis441 - 2010-07-23 9:58 AM is there any one to welcome me ? Welcome all. Russell ... Welcome from Wisconsin! It's a real hit or miss welcoming committee ... lol! Whoever is online at the time and if a forum member is busy or not. I'm headed for my heated garage soon and plan on working on installing a HID bulb plus other turn signal mods. Batavia, IL Hi all, just registered on the site. Bought a 2013 Vision yesterday in black. Traded my 08 Suzuki C109. I live in the far west burbs of Chicago so riding is still a few weeks away. Actually having the bike trailered to me, still too much salt on the roads. I am really looking forward to riding this bike. I sit on it and it's as though it was built for me. I have been reading about this thing for a year, hope it lives up to the praise that it gets. Angelica, NY Hi All I'm new to the Victory and went from a 08 Royal Star Venture to a 12 XCT. I live in the Southern Tier in NY along Rte 86 between OLEAN, NY and Hornell, NY. I'm going to be asking lot of question, hopefully you won't beat up on a newbie to bad. Rockland, MA United States michrick, Blowndodge - Welcome to the site! The more you participate, the more you get out of it! Don't be afraid to ask questions. Everyone is pretty friendly here. Even the old crusty members have a soft side, they just try to hide it. I am also new to both Victory and this site. Got my new (2012) Vision about a month ago. Love it! Getting ready for my 2nd 300+ mile ride with our group Saturday. I live in So Cal. thanks Jeff! I've joined the other 2 sites as well. I came as a former moderator on another brand of bike for 6 years. Finally upgraded to the XCT. I accidently test road one and................. well you know the rest! I will do my best to contribute. BTW I stay out of "oil" wars!!! Manchester, CT I too am new to the site as well as to Victory. I was originally looking to purchase a HD Ultra Glide. My cousin just happened to be at the Victory dealer purchasing 2 new Yamaha jet skis (Dealership - motorcycles, quads and jet skis). We were going to meet at the dealership and then head out to a Harley dealer to see what kind of deal I could get. Thanks to my cousins advise, I checked out the Victory Cross Country and Vision. It took me all of 15 minutes to change my mind. That day I put a deposit on a 2013 Vision. My bike came in last week and the dealer is waiting on the chrome options I ordered along with the trunk rack, luggage liners, airhorn and GPS. I can't wait for the weather to cooperate so I can take the bike out on its maiden voyage. If there are any riders that live in the Hartford CT area please let me know. Bangor, WI I'm officially part of the forum now I guess. Been lurking and looking for awhile. A good friend and fellow rider is on his second Vision. I had a chance to see a Vision up close and ride with a Vision rider for a few years. He is also knowledgable and someone who knows his way around a motorcycle. I bought a 2008 Vision April 2013. I have enjoyed every (s)mile I've put on the bike. Had 9000 mile on it. Has 16200 on it now. So that's it. Glad to be here. ljurgens, I live in your area. If your Vision is orange, I bet I've seen you on the road. Victoria Tx, TX United States Welcome.... Now Enjoy!! Welcome to the site blukaw! Bangor, WI Thanks for the welcome. Henderson, CO United States New guy here. Just got a 2014 XR 8 Ball. Love it so far! This is my first American bike and my first cruiser / bagger. I need help with my 2004 Vegas,it's fouling my plugs and jerks badly.How do I post questions.. If you want to, you can hit the "New Post" button at the top of the page and start a new thread with the details of your bike and any problems. The more specific you are with what you've done to your bike, and the conditions leading up to your plug fouling problem, the better the responses will be. Hi Everyone, I'm new to the forum and to Victory. I have been looking at new HD and Victory bikes all winter long. Finally last week, I pulled the trigger and purchased a 2013 Arlen Ness Victory Vision. It's currently at the dealer getting the S1L1 kit installed. Looking forward to nice weather and many (s)miles ahead. used to super sport motorcycles, my othrr bike is a 2009 gsxr 1000.
hoping the cross country isn't to let me down. bluekaw - 2014-04-13 2:22 PM I'm officially part of the forum now I guess. Been lurking and looking for awhile. A good friend and fellow rider is on his second Vision. I had a chance to see a Vision up close and ride with a Vision rider for a few years. He is also knowledgable and someone who knows his way around a motorcycle. I bought a 2008 Vision April 2013. I have enjoyed every (s)mile I've put on the bike. Had 9000 mile on it. Has 16200 on it now. So that's it. Glad to be here. ljurgens, I live in your area. If your Vision is orange, I bet I've seen you on the road. I love the Orange, but mine is solid Black. Bought it right before the snow started falling last fall, so I've only got 750 miles on her so far. I was out cruising this past Saturday though! MINESS31 - 2014-04-29 10:36 PM Hi Everyone, I'm new to the forum and to Victory. I have been looking at new HD and Victory bikes all winter long. Finally last week, I pulled the trigger and purchased a 2013 Arlen Ness Victory Vision. It's currently at the dealer getting the S1L1 kit installed. Looking forward to nice weather and many (s)miles ahead. Thanks ljurgens, based on the previous reply you have an orange vision? Is it also a Ness Vision? Bangor, WI It looks like yours, only Super Steel Grey. New to this site. Bought my 2011 CrossRoads in 2011. Got a little over 17,000 miles on it now. The way I read on these sites it is just getting broken in. Been a good bike got a few mods to. So I will try and post a picture or two later, the photo site is not working right now,of course,ha,ha. (the way things go sometimes). New to this site. Have a 2011 Cross Roads. It is about 17,500 miles new. Hi all, I just bought a 2008 Vision last month. I joined the forum to learn more about this bike as well as gain new friends. Moncks Corner, SC United States Welcome, and enjoy. You will find alot of good information here regarding maintenance and upgrades. Hi guys! Been lurking here before and now I decided to join. I ride a 2007 Vegas. See you around guys. Lots of us have more than one bike and more than one Victory. The others tend to get neglected after we get a Vision. Eagan, MN United States Hello, I'm a sort of new guy here. I guess I registered back in 2009 when I bought my Jackpot. I've come around from time to time but this is my first post. While I know there are other networks I always felt this site was mainly geared toward Vision riders. Well, tonight after work I will become a Vision rider so figure I should introduce myself and start participating! I will be bringing home a new 2013 Nuclear Sunset Vision this evening after work! I've done a lot of riding on my Jackpot but I am looking forward to all the creature comforts, better handling and weather protection the Vision has! I've already used the information here to order some led's to add to the back for a 3rd brake light and turn signals. So I already have to say thank you for the great information! Hey Chris! Great looking ride! West Salem, WI United States Welcome, that's my favorite Vision color! Vale, NC United States Hey! from Western NC. Been a long time rider and just traded my BMW RT for a 2014 Cross Country Classic. Enjoyed getting the "break-in" miles completed on the Blue Ridge Pkwy this weekend. I get the first service done Tuesday and on Friday I head out on a trip through the Ozarks, Smoky's and then up through New England. New Bohemia, VA Mick, welcome aboard, the board. I hope you enjoy your ride and would like to hear you share your experience. I use to be very active on this board, but many of those who I enjoyed bantering with have apparently gone off to other things. Mostly the board became a debate for oil and tires, just like many other forums become. You will still find useful maintenance tips and discussion, so don't be afraid to throw a post out there looking for information or just to discuss something. Others will say many have gone to Facebook, but there again, many of the threads I find on Facebook is talking about oil and tires, car tires that is, a very boring subject to many. There are a lot of good people here that will give an honest answer to many of the questions you might have, will encourage you in trouble, and share in your Victory! Bel Air, MD Hey Mick, welcome to the Victory family. I saw that you already found the Hammer Riders site. Enjoy the new bike, and if I can, I would suggest that one day you also treat yourself to another kind of riding experience on a Vision. G'day brothers ( sisters too, so they don't feel left out) If you haven't guessed I'm form OZ Our Sydney dealer has a saying to every potential customer that walks through the door. It is, Ride one and you'll own one. Well I took that as a challenge and needless to say within a week I had sold my beloved GSX1400 and was picking up the most AWESOME bike on God's creation. It is a 2014 Hammer S LE No:010 in pearl white and matte black. I have just put a set of Freedom Performance pipes on and a Hi flow filter. Thanks guys for the forum. Lsibon Falls, ME United States Hey everyone, I'm new to the forum but not Victory. I just picked up a 2011 Cross Country to replace my 03 V92 Deluxe. I have not ridden it much so the anxiety is already there for Spring to get here. Gonna be about 8 weeks till I get to ride again unless I get lucky. Hey everyone, I'm new to the forum but not Victory. I just picked up a 2011 Cross Country to replace my 03 V92 Deluxe. I have not ridden it much so the anxiety is already there for Spring to get here. Gonna be about 8 weeks till I get to ride again unless I get lucky. Congrats on the Cross Country! We ride year 'round down chair. Couldn't 'magine havin to park my Vision fer a spell 'cause of the weather. Just joined up after buying a "new" 2012 Victory Vision Tour w/640 miles on the clock. So far 2100 miles and I am very impressed with this bike after owning almost everything else since 1958 when I began riding. Hope to get lots of trouble free miles and smiles out of this unit. West Salem, WI United States Welcome motomi1, you're going to love that Vision ! Retired US Navy ETC(SW). Westcoast Sailor. Gators, Carriers and Detroyers. Proud owner of a used 2009 midnight cherry Vision Tour w 24k miles in October, well 30k now . I have already upgraded my air filter and added a top filter. Further mods for this weekend include WD slip on mufflers and a Weisco FMC. I love the riding season (11 months/year) here in N. Fort Worth,Texas. I ride everyday as long there is no ice. I ride to ride, no destination, as long as the wife tells me to get out of the house. Keep frosty and out of the port or starboard quarters of those Accords. Because he/she is on the phone and cant check her mirrors!!! Katy, TX United States Welcome to the Vision and thank you for your service to our Country. Rockland, MA United States Welcome Rodhotter! This is the forum that started it all. , DE United States Glad to be here, I've already learned a few things in just a few days of perusing the posts. I pick up a new 2016 Vision in blue, on Friday, 12May from the Victory dealer in Metuchen, NJ. Great deal and they seem like nice folks to work with, so far. Riding the "Uncle Joe" express up there (Amtrak) to be able to ride it home. Anyway, I read the break-in posts, so I'll vary the speed and take side roads once I make it back into DE. Bel Air, MD Congrats and welcome! You are going to love the Vision. Sand Rock, AL United States it's a great bike and glad to have you here brother. Howdy, all! We are looking at 2008 Victory Vision as next project bike. Kinda new to the thing and thought to join here for knowledge. Sand Rock, AL United States welcome friend! Mossyrock, WA New Vision owner here. Recently purchased a 2009 Alen Ness #119. The original owner took off the original body panels and seat and purchased the solid black ones when the bike was new a trunk and a Corbin seat which I received in the purchase. Never considered a Victory before mush less a Vision, but something about the solid black grabbed me. Been riding for fourth years and have sport bikes, dirt bikes, dualsport bikes and adventure bikes; but never had a cruiser before. 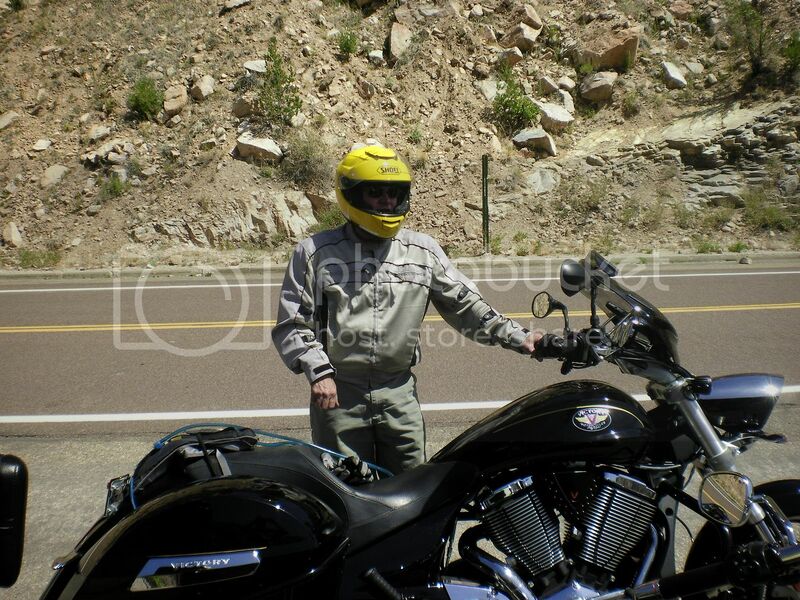 I went to a Harley demo day 2 years ago and rode 2 Road Glides with and without the tour pack. All I thought was what a evil handling pig. So over the the last year I have been riding with some guys at work who have Harley's while I have been riding my Yamaha Super Tenere. Have to admit those guy went down a few dirt roads with me including going through a foot deep water crossing; ok it was a two track trail with water a foot deep for about a half mile. So I started looking at bikes and read some reviews about Visions, and found a used on at a dealer where I could test ride one. I was not intending to buy it, I just wanted to see how they rode. Well I bought it. Even with crap tires, I was shocked one how it handled. Anyhow been surfing around here, downloaded a few things and have been reading up. Modes the mufflers with the Magnaflows, ordered new tires and scored a set of factory heated grips from eBay. Now just waiting for the snow to leave to do some riding.